Give us eight seconds. We know that you know that time is important so we’ll keep this short. Considering that the average person’s attention span is just over eight seconds means that by about the time you finish reading this you’ll be thinking about something else. That also means the initial time spent on connections and relationships you make in life and business need to be meaningful and memorable. Welcome to better introductions. To establishing relationships. To getting the contact. First dibs. Last word. Welcome to your secret weapon. To a business card that sets you apart. A business card that gets saved. 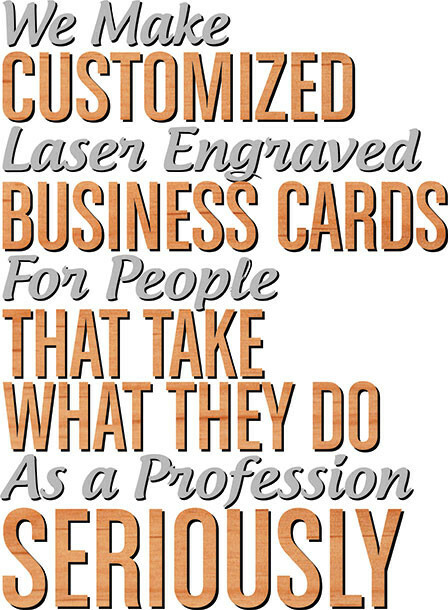 Welcome to Proper Recognition, a design studio specializing in high quality laser engraved business cards. With over a decade of professional fabrication and design projects under our belt, we’ve produced thousands of laser engraved business cards during that time. Our clients know that they can no longer count on that old box of 5,000 paper business cards. They know that first impressions count. They know that a standout business card in addition to a good pitch and proper networking skills increases their chances of getting noticed. They know that every move counts. That’s why Proper Recognition offers beautiful and unique laser engraved business cards on a rich palette of materials like wood, metal, and plastic – materials that help you stand out. Because as simple as a business card can seem, it is your first impression, it says you take this opportunity seriously and it says you take yourself seriously. Laser engraved business cards are the perfect way to leave a lasting impression and get the proper recognition you deserve. Let’s get you suited up with some real business cards. You can begin viewing some customizing options by visiting the shop. You can find answers to some frequently asked questions. If you want to see some recently finished card orders check out the gallery, or if you want to know how laser engraving works you can get familiar with our process. Any questions, please let us know.